RIFT’s Public Test Shard (‘PTS’) was updated on the 31st March 2015 with an exceptionally large 4.79GB update. This is the largest single update on the PTS so there’s quite a few things to go through. If you’re interested in the datamining, Part 1 can be found here. 3.2 Wardrobe System. Appearance collections, Dye System, Weapon Wardrobe. New Achievements. Moonshade Highlands (‘Echoes of’ Level 65 mobs), Nightmare VI, Hammerknell Fortress (Abyssal Lifter mount), Fishing, Boar Mount achieves. Crafting Additions. Crafting Quests (daily/weekly), New Craftable Minions, Outfitter Bags (28- & 30-slot), Fishing Improvements. Dimension Additions. Sky projectors, Indoor/Outdoor vfx, Interactive items, Dimension Cats, New Music Boxes, Previewing the Dimension Items. Gear Update. Tier 1 cost reduction, Tier 2 raid gear, Stats, Nightmare Seal upgrades. Other Info. NT Onslaught Quests (Daily/Weekly), Instant Adventure changes, Elo Rating Visible, Mounts Sorted by Mount Speed, Twisted Artifacts in PoW, Panetouched Wilds location, Tier 2 Testing portals, Lock Window Size (Setting). The 3.2 Wardrobe System changes are up on the PTS for testing! If you have any feedback or want to report a bug, you can do so in Senior UI Artist Gingers’ thread here. Need an overview of the Wardrobe System? Check out last week’s Livestream Summary. I won’t go over too much because there’s nothing ‘new’ compared to information already provided on the 3.2 Wardrobe System. All your existing wardrobe items have been sent to you via in-game mail. The wardrobe items and their dyes have been maintained in the new system. There’s now a collections system where having an item will collect its appearance to your characters, region-wide. Clicking on a wardrobe slot will open a new window where you can view all items you have collected. Select one and click ‘Save’ to save it. Right-clicking a wardrobe slot empties it, making you view your currently equipped gear. Unticking the checkbox in the corner will make that slot ‘naked’. There’s now also weapon wardrobe. Works the same way as other slots. No need for Transfiguration Baubles anymore. You can rename your wardrobe sets. The dye system has changed. When you click on a dye slot you can now choose from a whole list of Dye Bucket colors. These are unlimited use. Dye Buckets are unlocked account-wide using Credits. Dye Buckets are unlimited use. You will get a small assortment of free Dye Buckets when 3.2 hits. (These are currently not displaying on the PTS; known bug). You can still use your old single-use dyes. They will still be craftable/available for purchase. However, they will not be added to the dye selection window because they are single-use. They will only show up in the dye slot itself. Exceptionally Dyes cost 450 Credits each. (like Exceptionally Pink). ‘High-cost’ Crafted Dyes cost 270 Credits each. (like Dark Rose). The ‘silver’ Dyes cost 9 Credits. (like Dark Blue, Red/etc). Note: Currently there’s a bug where some of the dyes (most likely the ‘silver-cost’ Dyes) are not automatically unlocked for players. This is a known bug. Also, since this is PTS, prices are subject to change. There’s a few bugs with the latest wardrobe system including a handful of items not being sent back via mail (like the Helm of the Demon Lord), appearing as “?” icons, missing wardrobe appearances, 2-handed swords, 1-handed swords, 2-handed scythes/etc not appearing for Clerics and some dyes not appearing. You’ll also notice that the right-side gear slots for your actual gear are missing. This is known bug. If you find any bugs or have feedback, please post in Gingers’ feedback thread here. Achievement total has increased to 35,552. There’s a total of 180 new achievement points in Zones -> RIFT -> Moonshade Highlands. As you can see, they relate to Hammerknell Fortress, although the achieves themselves don’t have to do with anything you do in the raid. These relate to ‘rare’ mobs that appear in the Moonshade Highlands zone that you must defeat twice. Echo of Sicaron. Src: Slipmat. Interestingly the mobs are Level 65, although they are neutral. Looks like Trion wants Level 65 players to journey out to Moonshade Highlands. I wouldn’t be surprised if they add in a new zone event either. Nightmare VI: Master achievement and all associated achievements. Total 298pts. New daily and Challenge daily from the NMRVI NPC (next to all the other NMR scholars). Lure: Nightmare VI costs 30k Planarite + 45 Void Stones. Lure: Nightmare VI Instance costs 160k Planarite + 320 Void Stones. New Seal tiers. I’ll talk more on the seals later, but know there’s now two new major tiers, pushing stats from current max of +205 to +245. “The Sixth Nightmare” artifact set will probably be able to be completed now. It doesn’t have any special rewards though. Not new, as both the Sixth and Seventh Nightmare artifact sets have been searchable under Character window -> Artifacts since NT launch. As we already know, the old Level 50 HK achieves will become Legacy. That hasn’t shown up on the PTS yet. Also, Chronicles -> Hammerknell: Runes of Corruption is still empty. New with this update is that the Level 65 Hammerknell: Conqueror achievement has had its reward updated. The mount is no longer the placeholder Storm Legion Lifter mount and is instead the new Abyssal Lifter mount. Abyssal Lifter mount – 155% or matches fastest mount speed + Amphibious. Unfortunately you can’t rotate the preview vertically so can’t tell if there’s anything special at the top. The bottom looks to be a spine wrapped around some blue gelatin. Recognize the icon? Yep, one of the three Lifter mount icons recently datamined. That’s one down, two to go. A new achievement found under Character -> Fishing related to Uncle Stan. And yes, he is now also at the craft stations in Choreburg, Draumheim. He has a new NT fishing daily – but more on that later in the Crafting section. We’ve got two new achievements under Promotions: “Porkologist” and “Boar’s Bane”. Looks like this time round we’ve got 3 daily quests and two hunt quests. The reward is obviously placeholder, but this will likely be a new Promo Week for the Battle (War) Boar mount. The Concept Art for these mounts were shown off alongside other interesting item concepts just last month. 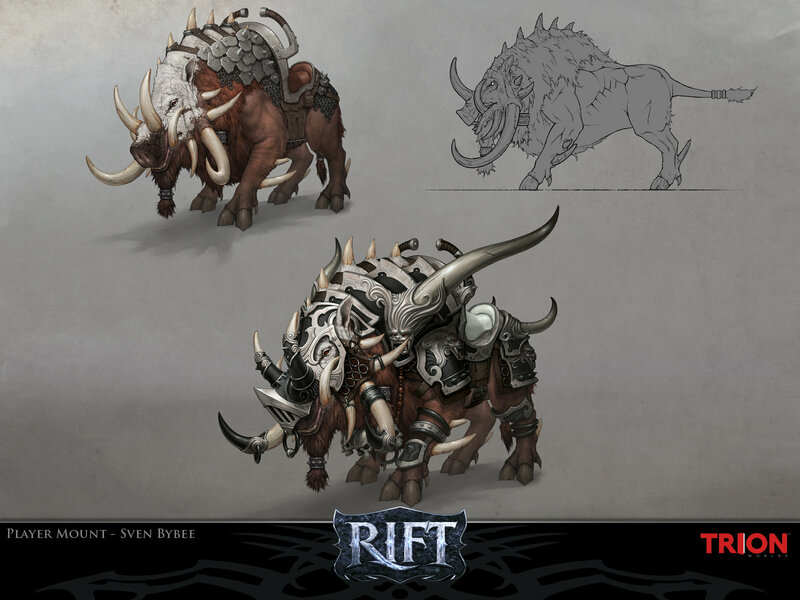 RIFT Concept Art Boar Mount. More interesting concept art here. Look forward to these mounts popping up at some point in the future! A fair few additions and changes to Crafting was added in. These changes are slated for RIFT 3.2: Echoes of Madness. Some new quest NPCs/quests have popped up for crafting. The Savant crafting daily NPC Elena Lyra has been added to Tempest Bay outside the crafting station at (12774, 11685). She gives the same quests as Choreburg. There’s a weekly for every main craft profession except Dream Weaver. You can only choose one per character per week. 1 plat, 86 gold and 6 silver. You will need to purchase the quest Recipe: Congealed Dreams from RIFT Store -> Crafting -> [profession]. Each profession has its own version of the Congealed Dreams that require mats appropriate for the profession. Howard is located right next to the Savant Crafting Daily NPC Elena Lyra in Choreburg’s crafting station, Draumheim. Howard <Congealed Dreams Purveyor> is the new NT craft weekly questgiver who is located near the daily questgiver in Choreburg, Draumheim. Morticus started off with giving us the C1-0N3 minion card for Nightmare Tide. He has now added in one card for each major craft profession. All the cards have maximum stamina of 30. All cards are Attractor minions. All the new minion card recipes cost 75 Grandmaster-, 250 Master- and 1k Artisan Marks. Enables up to two new Dimension adventures per deck when the card is currently on an adventure. Enables up to two new Assassination adventures per deck when the card is currently on an adventure. Enables up to two new Harvesting adventures per deck when the card is currently on an adventure. Enables up to two new Hunting adventures per deck when the card is currently on an adventure. Enables up to two new Diplomacy adventures per deck when the card is currently on an adventure. Nightmare Touched Bag. 28-slot bag gained from Outfitter Trainer. Amended Bag of the Tide. 30-slot bag gained from RIFT Store -> Storage. The 28-slot Nightmare Touched Bag recipe can be bought from your local Outfitter trainer. It has the same amount of slots as the Empyrean Bag. However, it uses Nightmare Tide materials instead of Storm Legion materials. Unfortunately the cost of the mats required for the bag are rather high and it is vastly cheaper to make the 28-slot Empyrean Bag. This could be subject to change though. The Amended Bag of the Tide is a new 30-slot bag. It is Unique so you can only have one of it per character. Found in RIFT Store -> Storage. Costs a Dreaming Rune Amender (Runecrafter), Lucid Dreams (Dream Weaver) and Nightmare Textile Amender (Outfitter). Or 2,500 Credits (2,250 for Patrons). Fishing Lures now last 5min. Artifact Lures now last 2min. Extended duration Artifact Lures now last 4min. Fisher’s Friend. A new premium item called “Fisher’s Friend” found under RIFT Store -> Crafting (and Services) will reset cooldown on all fishing lures. Costs 175 Credits each (157 for Patrons). Cooldowns mainly relate to special artifact lures like the Rare Artifact Attractors. Fishing in low-level (gray) areas will now grant skill-ups, although at a much lower rate than fishing in level-appropriate areas. A new fishing rod is also going to be available, although it doesn’t seem to be on the PTS yet. Uncle Stan now has a daily quest in NT which gives your choice between craft marks, notoriety, Tarken Treasure Chest or Recipe: Rare Atragarian Artifact Attractor. Uncle Stan is located next to the Savant Fishing trainer at the craft station in Choreburg, Draumheim at (5914, 5551). New Twisted Atragarian Lure recipe is available under RIFT Store -> Crafting -> Fishing. This lure lasts for 2min and guarantees that you fish up Twisted artifacts in Brevane, Dusken or Plane of Water. Requires Atragarian or better Fishing Poles. Atragarian fishing pole doesn’t seem to be on the PTS yet. Quite a few new dimension items were added in with the PTS including new sky projectors, various interactive NPCs & objects, and a Dimensional Cat Vendor. Steppes of Infinity Sky Projector for 9,000 Infinity Stones or 550 Credits (495 for Patrons). River of Souls Sky Projector for 7,500 Sourcestone or 650 Credits (585 for Patrons). The currencies are obtained from open world activities like daily quests, onslaughts and zone events in Storm Legion zones (Infinity Stones) and Mathosia zones (Sourcestone). Indoor/Outdoor Flurrifier for 150p or 212 Credits (190 for Patrons). Indoor/Outdoor Perm-a-Froz for 30 Lucky Coins (Artifact Set currency) or 300 Credits (270 for Patrons). These will add snow vfx to your entire dimension, with the Perm-a-Froz adding that extra blizzardy atmosphere. A huge plethora of dimension items were added under RIFT Store -> Dimensions -> Interactive. Revelation Imp, Artifex Zaviel, Arethea and Awakened Akvan Totem cost 1,364p 70g 50s or 875 Credits (787 for Patrons) each. Abandoned Cultists, Sleeping Draumheim Resident, Mistress Inyra, Kondraum’s Liver, Guardian and Defiant Guards, Lord Arak Radio, Ghar Network, Cosmologist Mann’s Journal and Finric Rhen cost 176p 47g or 500 Credits (450 for Patrons) each. 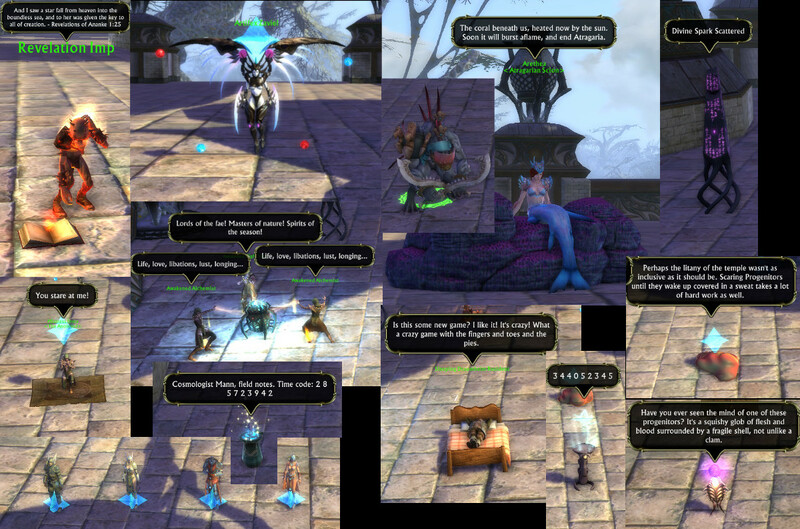 Several of these NPCs have multiple lines that they’ll say at random when you interact with them. They will also speak automatically without interaction. The Revelation Imp for instance has a large amount of lines, and Arethea will sing Siren Songs. The Guardian and Defiant Guards will face and salute you if you approach them. You can find all these dimension items on the PTS under RIFT Store -> Dimensions -> Interactive. Or, check out my dimension “RIFT 3.2 Dimension Items Gallery”, Owner: Marko, Location: Auditorium Carnos Plaza if you want to interact with them all. These are considered ‘Dimension Unique (40) Family (NPC)’ so you can only have 40 of these items in a single dimension. You can now find new <Dimensional Cat Vendor> NPCs: “Key Whee” in Sanctum and “Dee Vah” in Meridian. The NPCs paths all over the place, both outside and inside in Sanctum/Meridian. The NPCs will only stop when someone is speaking to them. Just have a “tar Key Whee” macro for Sanctum and “tar Dee Vah” macro for Meridian and spam that whilst running around Sanctum or Meridian and you should find her. Key Whee sells a variety of stationary cats for 176p 47g or 250 Credits each (225 for Patrons). These cats are: Calico Cat, Corpus Kitty, Brown Siamese Cat, Grey Siamese Cat, Mathosian Fold, Spot and Tabby Cat. They are ‘stationary’ in that they won’t wander off from their current spot. However, they’ll lie down, move their tails, get up, stretch and change facing direction. Again, you can find these up in the “RIFT 3.2 Dimension Items Gallery” on the PTS. These boxes are available for 28p 23g 52s or 40 Credits (36 for Patrons). Cost reduction to Tier 1 mark armor. Also available for Credits now. New Tier 2 mark armor. Nightmare Seals have two new upgrade tiers, and upgrade changes. Tier 1 mark armor have had their costs reduced. They are now also available for Credits on the PTS as they are no longer BiS. Chest/Legs – 13,200 Fragments of Horror or 9,450 Credits each. Helm/Shoulders – 10,400 FoH or 8,100 Credits each. Globes/Belt/Boots – 6,840 FoH or 6,300 Credits each. Note: Weekly caps have not changed. Tier 2 mark armor is now available on the RIFT Store -> Equipment -> Armor on the PTS. They use new Fragments of Madness currency. Chest/Legs – 16,500 Fragments of Madness each. Helm/Shoulders – 13,000 FoM each. Globes/Belt/Boots – 8,550 FoM each. The number of fragments of madness required is the same as Tier 1’s original prices. Click on the above image to see a full view. The Hit the new armor gives is +175. There’s currently no relic upgrade component. Note: I’ve removed all the excess tooltips to save space. The armor still uses current synergy crystals. Nightmare Seals have had their upgrade paths changed slightly. Instead of upgrading bit by bit, you will now upgrade straight to the next tier (i.e. from NMR2 to NMR3-quality). Upgrade costs have not changed. If your seal is in-between tiers, it’ll still use the old upgrade system up until you reach the next tier. Nightmare Seals are also getting two new tiers. This turns the current max stat of +205 to +218 and +245. As you can see, the upgrades require new “Nightmare Realignment Tools” that are supposed to be gained from the NMR daily NPCs, although these don’t seem to be showing up on the PTS just yet. Given that there’s two new upgrade tiers instead of one, Nightmare Rift Rank 7s might also be appearing. That said, only the Nightmare Rift Rank 6 achievements are currently up. As for Essences – there’s no new essences in the RIFT Store right now. These require that you defend Coral Relays (onslaught/foothold) found in Plane of Water zones from invasions and defeat Planar Commanders (think this refers to zone event bosses). Daily rewards 40 Void Stones and some plat. Weekly rewards 2,500 Void Stones, 500 Abyssal Crusader’s Marks, 100 Fragments of Horror, PA XP and some plat. Quests are given by Grulish (Daily) and Shissa’Ar (Weekly) in the middle of Flargle Plaza, Draumheim at (5549, 5523). Instant Adventures have been changed. You can no longer queue for a specific zone. Instead, you’ll have the option between “Random Adventure” and “Featured Adventure”. With the release of 3.2, the new Hammerknell Fortress Instant Adventures will be featured. At present clicking ‘Join’ on Featured Adventure: HK does nothing so the adventures might not be on the PTS yet (or simply not enabled yet). New Anti-leeching measures have been added in. If you are AFK you will be kicked from the IA group. If you do not contribute, you will receive no credit when an adventure completes. Tacitus has also mentioned that after not participating in a few adventures, you will get a 15min IA deserter debuff. You won’t be able to join an IA group whilst the debuff is up. (I haven’t tested this feature enough to see if it’s currently active on the PTS). Note: Existing IA Achievements will be moved to Legacy. See Tacitus’ post for more details. As mentioned briefly in last week’s livestream, your PvP tab has changed and now your Elo Rating is visible to you. Your Elo Rating is used as part of the Warfront matchmaking system. Very briefly; if you win your Elo goes up and if you lose your Elo goes down. This also comes with Win Percentage and no. of Wins/Losses/Ties information. Mounts in your Character window are now sorted by Mount Speed. 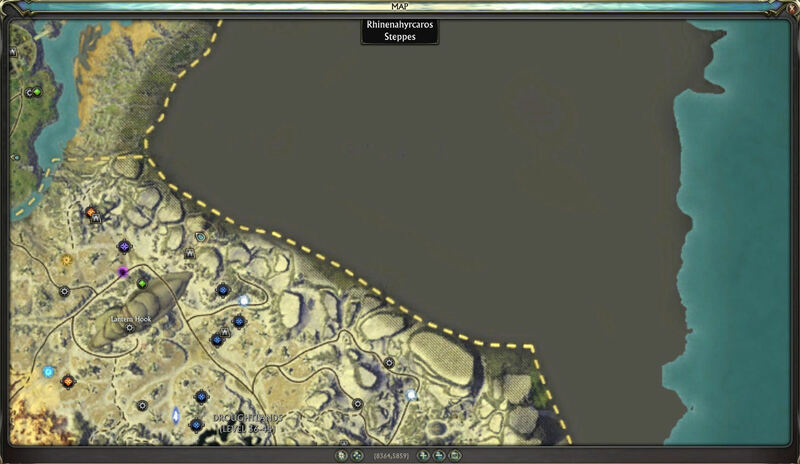 Trion has added Twisted Artifacts in the Plane of Water zones: Goboro Reef, Draumheim and Tarken Glacier. You can view them like with any other twisted artifact, by having Omen Sight or Quantum Sight buff up. A new location has been discovered for Planetouched Wilds! Slipmat was able to find a map tooltip for a “Rhinenahyrcaros Steppes” whilst traveling along the edge of the border between Planetouched Wilds and Droughtlands. Sorrowsworn Wall found by Twinmoon. Just a reminder that you can go into the Level 65 version of Hammerknell Fortress in Moonshade Highlands on the PTS whenever you want to test it out. You’ll need at least 3 people in your party to enter, and if you want to do anything inside you’ll probably want a full raid. Right inside the entrance will be several portals – each one will teleport you to one of the bosses in HK. Note that these portals are for testing-purposes only and won’t appear on Live. A new checkbox has been added under ESC -> Settings -> Video called ‘Lock Window Size’. As the name suggests, it will lock your window size so that you can’t accidentally resize it when you grab the edges. Interestingly, it looks like you can no longer minimize the RIFT client (at least on the PTS). Very huge update today with a ton of information packed in. Almost all of this should be coming in 3.2, slated for some time in April. Look forward to it! 2 strands of Arak needed for the new bag? With the same slots as the old ones? Are they joking? Yea, not quite sure what Trion were thinking when they added that in. Wow lots of stuff to take in! Omg so many new awesome things coming!!!!! The New Interactive Items , like the mermaid and the defiant/guardian guards , how we will be able to take them? They have only credit prize or plats also like the cats? You can get them for Plat or Credits. There’s a whole bunch of different prices. Some like the Revelation Imp and Arethea (the mermaid) costs 1,364p 70g 50s or 875 Credits (787 for Patrons). Others like the Abandoned Cultists, Guards and Sleeping Draumheim Resident costs 176p 47g or 500 Credits (450 for Patrons). I’ll add that to the article. Uncle Stan gives you a quest to get the Anatagarian Fishing Pole recipie. It’s real puple-glowy too. also on the new 28 slot bag, conservatively, it’s well over 300 plat in mats to make the bag, when a bag with the same # of slots goes for around 20 plat on the AH. Tier 1 gear from crecits. What about weapons ? are they released to for credits ? They haven’t released Tier 1 weapons on the RIFT Store yet. My guess is that they probably will at some point though.